It's Christmas in July! Can you smell the hint of brandy in the steamed plum pudding - yummmm. Ok so I got a little distracted there! Today some of my Art with Heart Stampin' Up! team girls are presenting some fabulous Christmas projects to inspire you. 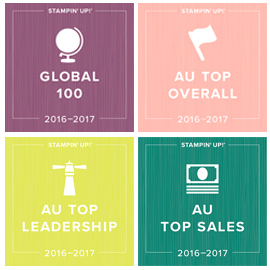 This year we already have new Christmas sets to play with in the 2015 Stampin' Up! Annual Catalogue, and some old favourites too. We also have a brand new 2015 Holiday catalogue coming soon. 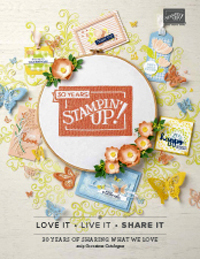 If you would like a copy of any of our catalogues, to attend a Stampin' Up! class or join a large fabulous group of crafty women by becoming part of the team (hobby demonstrators welcome), be sure to contact me. 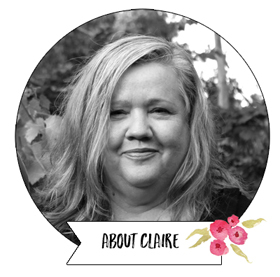 If you are not just starting the blog hop, you would have come to me from my lovely team member and friend Kayleen McClean. My first project is a gift card holder. These are great little holders and the best bit is you can make 3 from an A4 sheet of cardstock. The belly band slides off and it opens up for a gift card holder. Cut a piece of A4 cardstock in 3 vertically so you end up with 3 pieces 7cm wide x 29.7cm long. Using the largest Framelit from the Lots of Labels Framelit set, cut the rounded edge as shown in the photo below. Starting from the straight end, score at 8cm and 12cm. Using a 2" Circle punch, cut a semi circle in the straight end. 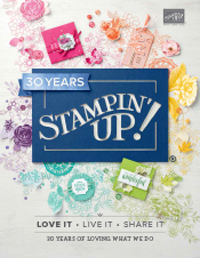 Cut a piece of Stampin' Up! Tear and Tape in half vertically (so you have two thinner strips). Use these to adhere the embossed pieces down to create the pouch. If you keep the tape the same width it's a bit of a tight fit for the card, but this fits and holds just fine. Cut a piece of DSP using the second smallest Lots of Labels Framelit and use that to decorate the front of the flap. Then just create your belly band and decoration. I used a 2 3/8" Scallop Punch, The Christmas Tree Punch, Lots of Joy and Festival of Trees Stamp Sets, Gold Glimmer Paper and Merry Moments DSP. Here's how I cut the curved end using the largest label Framelit. My second share today is a centre step Christmas card, again using the Lots of Labels Framelits and Lots of Joy stamp set. I got the idea for the Gold Glimmer circle (made by punching the 2" circle punch first, and 2.5" circle punch around the outside) from my lovely demo fried Linda Higgins. The teeny glimmer stars are cut with the Confetti Stars border punch. Now it's time to visit the next blog on our hop, which is the lovey Kathryn Ruddick. Have fun, and thanks for visiting our blog hop today. See you back here again soon.